Who needs Chinese take-out when you can prepare this simple dish in less than 40 minutes! Use any protein of your choice – pork, shrimp, chicken, beef, ham or crab meat. Together with the sauce, this is a great dish to go with rice. This recipe yields 5 Egg Foo Yung cakes. Heat oil in a skillet over high heat. Add shallots and garlic, cook for 1-2 minutes until fragrant. Add bean spouts and stir fry 1 minute. Add shrimps and pan-fry shrimps until pink and opaque. Remove from skillet and let it cool down. Combine 4 eggs with the cooked vegetables and shrimps. Heat oil in a skillet over high heat. Pour about 1 cup of the egg and vegetables mixture to the skillet. Cook for 2 minutes or until lightly browned on the bottom, then flip the egg over and cook for 2 minute or until the both side are lightly browned. In a small bowl, combine chicken stock, sugar, soy sauce, oyster sauce, corn starch and wine. Place the sauce in a saucepan and cook until thickened. 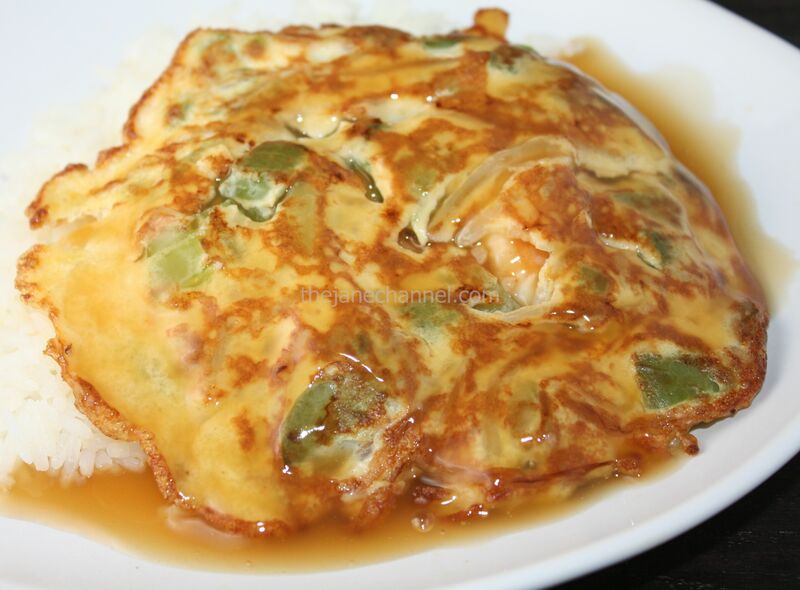 Serve egg foo yung with the sauce and rice.